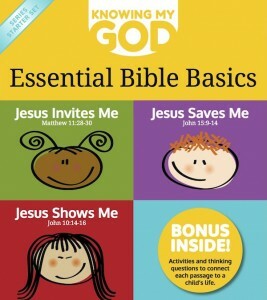 The “Knowing my God Series Starter Set” was recently released by publishing company Graham Blanchard. This gift set of board books includes three popular titles: Jesus Invites Me, based on Matthew 11:28 – 30, Jesus Shows Me, based on John 15: 9 – 14. and Jesus Saves Me, based on John 10: 14 – 16. These books aim to help kids make a personal connection with the words of Jesus, even from infancy. A keepsake book band holds the set together, which offers thinking and drawing activities for reflection. I had a chance to review these books. Even though they're board books, which are generally reserved for toddlers and babies, they were very useful with my kindergarten-aged daughter as well! The concepts are presented at a very basic level, good for the youngest believers, and would make an excellent gift for a baptism, christening, or dedication. They are theologically general enough to work for all denominations, and I love the activities and questions included, to help extend the learning from just reading the books to gently helping toddlers and preschoolers think about their faith and what it means.